NEW YORK — Down by three goals with 6 1/2 minutes left in the third period, the New York Islanders needed a break. The Detroit forward drew a major game misconduct for slashing and the Islanders took full advantage by quickly scoring four times on the power play. Brock Nelson then scored his third goal of the game 3:15 into overtime and New York, boosted by rookie Mathew Barzal's five assists, emerged with a wild 7-6 win over the Red Wings. "That was a roller coaster of a game," Barzal said. The Islanders were down 5-2 when Bertuzzi was penalized for slashing Cal Clutterbuck with 6:33 remaining. Nelson, Anders Lee, Nick Leddy and Josh Bailey scored in a span of 3:37 for a 6-5 lead. The four power-play goals in the third period set a franchise record. Bailey's goal gave New York its first lead of the game with 1:49 left in regulation. But Mike Green's sixth of the season with 29 seconds remaining forced overtime. Nelson completed his second career hat trick with his 14th goal, assisted by Barzal, and sent Detroit to its third straight loss. The Islanders had allowed an NHL-high 200 goals this season going into the game. They also had scored 181, third most in the league. "It's good to have (our offence) in our back pocket," Bailey said. "But I think we're a better team when we're the ones controlling the pace and making the other team chase the game a little bit." Barzal became the first rookie in NHL history to have a pair of five-assist games in a season. It was also his third five-point game, the first rookie in 100 years to accomplish that feat. Joe Malone did it in the NHL's first season (1917-18). Barzal is the fifth player overall to have multiple five-assist games in a season over the last 30 seasons, joining Wayne Gretzky, Mario Lemieux, Peter Forsberg and Pat Lafontaine. Jaroslav Halak made six saves on seven shots in the third period to pick up the win. He replaced starter Thomas Greiss, who allowed five goals on 32 shots. Jordan Eberle also scored for New York. Anthony Mantha, Martin Frk, Henrik Zetterberg, Darren Helm and Niklas Kronwall scored for Detroit. "It's not the ending we wanted," Mantha said. "Every point is important and losing one tonight like that hurts." Added Zetterberg: "We lost a point instead of getting one." Detroit took a 3-0 lead in the first period. Mantha scored his 17th goal 2:12 into the game, Frk followed with his 10th at 5:12 and Zetterberg snapped a rebound from the right hashmark over Greiss' glove at 14:40. Eberle's 19th midway through the second period made it 3-1 and Nelson scored early in the third. Detroit responded with two goals in 2:12 to go ahead 5-3 after Helm's tap-in at 7:42 and Kronwall's score at 9:54. Following Kronwall's goal, New York coach Doug Weight replaced Greiss in net with Halak. NOTES: The game was the second of three regular-season meetings for the Eastern Conference franchises. 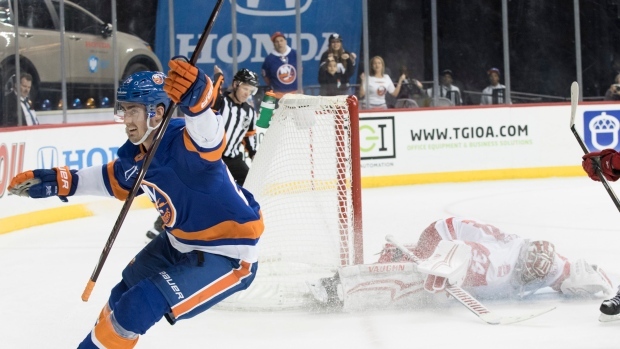 The Islanders and Red Wings will meet once more on April 7 in Detroit. ... New York defenceman Johnny Boychuk dressed and played for the first time since Dec. 28. He had missed 18 games with an upper body injury before being activated from the injured reserve Thursday. He played 15:18 paired with Leddy, and fought Detroit's Justin Abdelkader late in the second period, in which he landed three straight punches to the Red Wings forward while the two were entangled with linesmen. ... New York scratched D Dennis Seidenberg, C Alan Quine and C Tanner Fritz. ... Detroit scratched D Xavier Ouellet, LW David Booth and RW Luke Witkowski. Red Wings: At Washington on Sunday afternoon. Islanders: Host Calgary on Sunday night.